This macroscript takes a selected Box and then copies it's dimensions and creates a Fume grid with the same area. I got sick of having to drag out a real-world scale Box and then dragging out a fume grid to match. This just takes the extra step out of it. 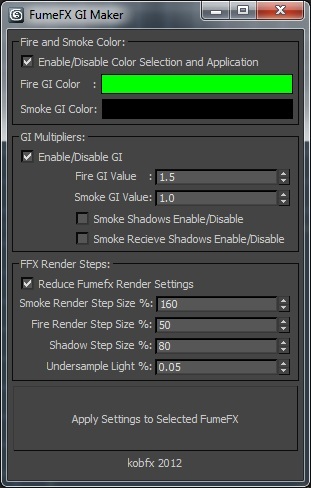 This script will divide a fumeFx grid into partitions. This can also be used to simulate a batch of fume grids locally or via backburner. More info and sample usages here.